Project Peru is an expedition carried out annually by Sixth Form students and staff from St John's School, Bishop Auckland and which began in 2009. Each year we work in partnership with the local community to carry out a building project and to date we have built classrooms, food kitchens, a bakery for training young people as well as facilities for people with disabilities. Weʼre raising £2,000 to fund a building project in Iquitos, Peru as part of the Project Peru expedition during July 2018. 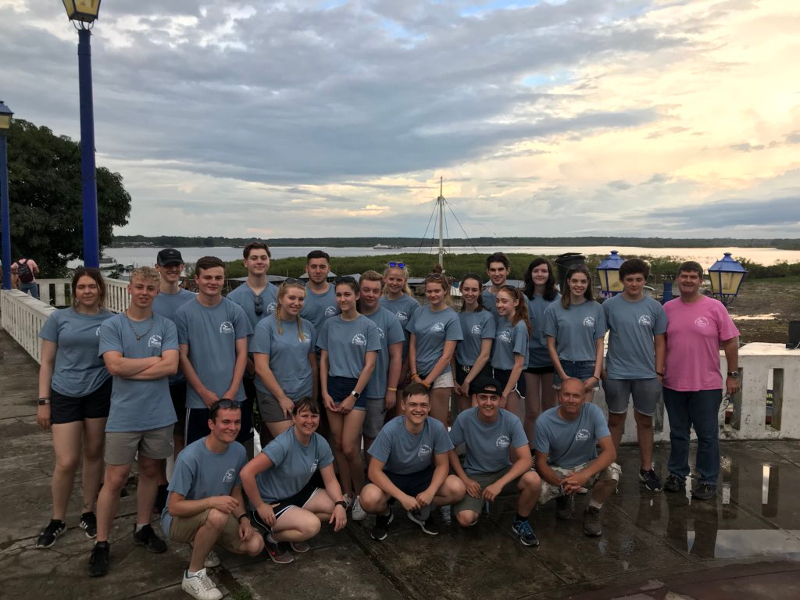 A group of 25 Sixth Form students and staff returned this week after an amazing two weeks in Iquitos, Peru working alongside Joe Plumb and The Peru Mission. The group assisted with the building of dining facilities in a local school and led workshops and activities at a children’s centre. Project Peru is an expedition carried out annually by 30 Sixth Form students and staff from St John's School, Bishop Auckland and which began in 2009. Each year we work in partnership with the local community to carry out a building project and to date we have built classrooms, food kitchens, a bakery for training young people as well as facilities for people with disabilities. 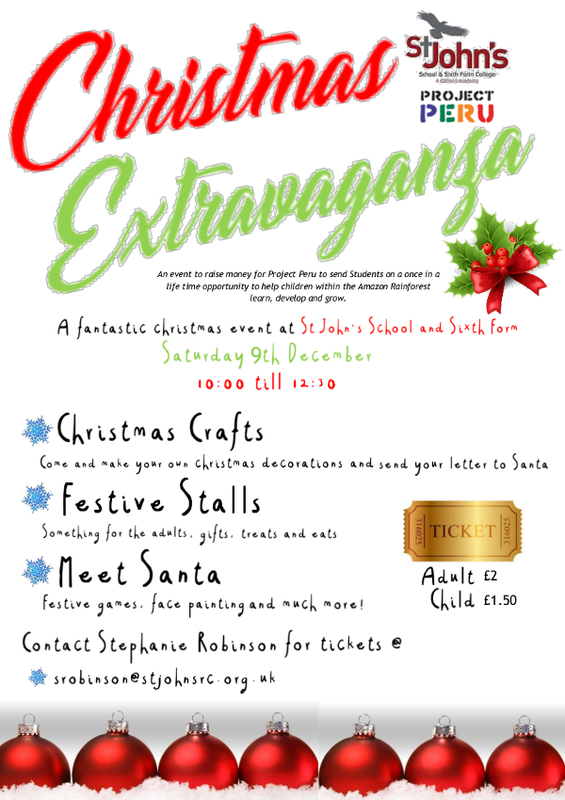 “Strictly St John’s” is an event which started in 2011 to raise money for Project Peru. In our version of ‘Strictly’ staff and Sixth Form students take to the dance floor to compete against each other in order to win the ‘Strictly’ glitter ball. The dances range from the Cha Cha Cha to the Waltz and the Quick Step. St John's hosted a Strictly Come Dancing competition on 16 and 17 February 2011 to raise money for a humanitarian project in Peru. Members of staff, and some of the school's Sixth Form students paired up and battled it out on the dance floor in front of a panel of judges. Couples performed iconic dances from the show including the waltz, the foxtrot and the Argentine tango. During the Christmas Holidays Staff and Sixth Form students from St John's packed bags at Sainsbury's and raised £1200 for Peru. Another year's committed fundraising culminated in Project Peru 2010 in which a group of 25 Sixth Form students and 5 staff joined Joe Plumb to work in some of the most deprived areas of Lima's shanty towns. In June 2009 a group of 30 Sixth Form students and staff from St John's Catholic School & Sixth Form Centre went out to work for two weeks in one of the shanty towns of Lima, capital of Peru. The money raised for Project Peru 2009 was used to completely rebuild and equip a food kitchen which serves over 100 adults and children living in extreme poverty in an area called Raucana. 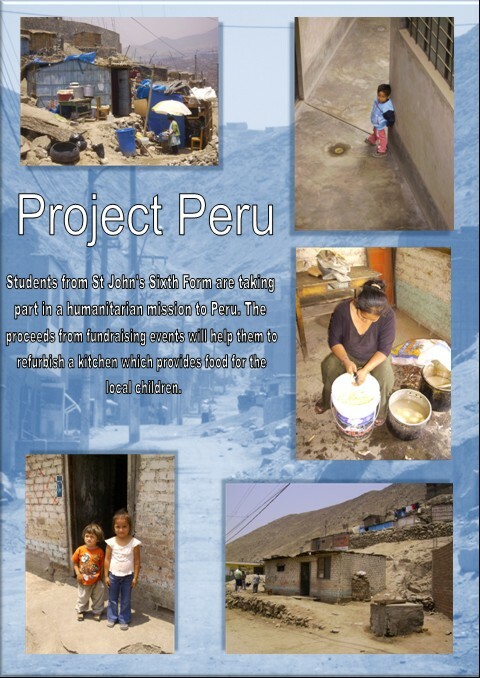 In June 2009 a group of 25 students and 5 staff will go out to work in one of the shanty towns on the outskirts of Lima. Through the project we will join with one of the local communities to refurbish a food kitchen which provides meals for 90 children and up to 20 elderly people each day. Without this facility these people would go hungry. We have also established a link with a school in one of the shanty towns. "This is an outstanding school. Students’ attainment by the end of Year 11 is high and the level at which they achieve in relation to their average starting points is excellent."